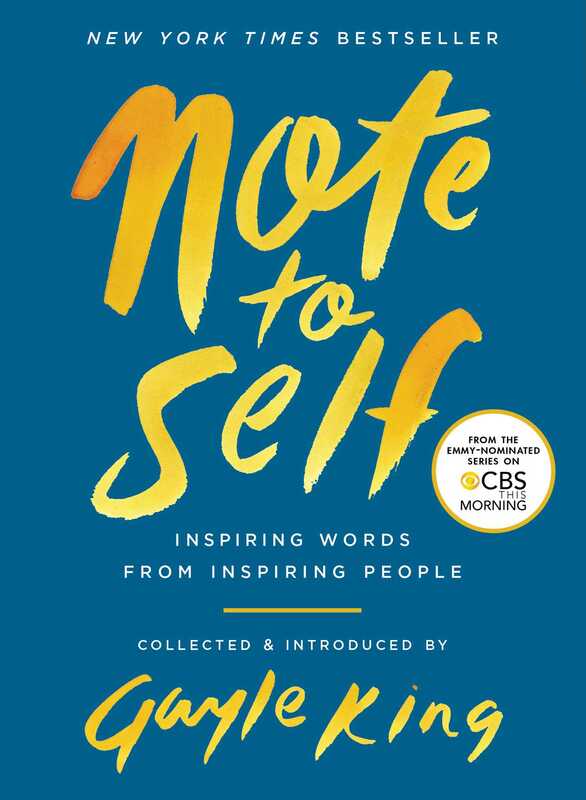 In this New York Times bestseller, Gayle King collects her favorite inspiring letters from the popular CBS This Morning segment Note to Self, in which twenty-first century luminaries pen advice and encouragement to the young people they once were. What do Congressman John Lewis, Dr. Ruth, and Kermit the Frog wish they could tell their younger selves? What about a gay NFL player or the most successful female race car driver? In Note to Self, CBS This Morning cohost Gayle King shares some of the most memorable letters from the broadcast’s popular segment of the same name. With essays from such varied figures as Oprah, Vice President Joe Biden, Chelsea Handler, and Maya Angelou—as well as poignant words from a Newtown father and a military widow—Note to Self is a moving reflection on the joys and challenges of growing up and a perfect gift for any occasion. I remember feeling embarrassed, looking around the room to see if anyone else had heard him and wondering if other kids felt the same way. I remember rushing home after school to ask my mother if Wayne was telling the truth. My mom reassured me: “Wayne Viviano doesn’t know what he’s talking about,” she said. So if I could send that skinny little nine-year-old girl with the braided pigtails and the happy smile a message from the woman she had grown up to be, what is it I would tell her? That’s the premise of our “Note to Self” Emmy-nominated series on CBS This Morning. We asked visionaries, entertainers, politicians, humanitarians, athletes—even a Muppet—what they’d want to tell their younger selves, and we filmed every man, woman, and frog as they read their answers. The real question is this: How would you answer if you could write the younger you a letter? What advice, comfort, insight would you choose to include? Would you let your seventh-grade self know that sometimes insecurity comes across as mean? Would you tell your twentysomething self that not getting the job you thought you really wanted was actually a blessing in disguise? Would you share your hard-earned wisdom that it’s dangerous to see your worth through somebody else’s eyes? Maybe you would choose to concentrate on how to manage life’s big relationships. Imagine being able to send word that marriage gets complicated and that sometimes the decision to stick it out—or to leave—is the best one you will make in life. Or maybe you could warn your younger self that the parents you thought were invincible will make some giant mistakes. I don’t know about you, but there were a few times when the only thing my younger self wanted to hear was very simple: You are going to get through this with your body and soul intact. That’s also the healing message of our segment, and of this book. Reading these letters is just about as thought-provoking, wrenching, relatable, funny, powerful, and comforting as going back in time and delivering a Note to Self message of your own. That’s partly because each person in this collection speaks from a place of hard-won enlightenment. They are people who’ve been tested. Many have gone through unimaginable loss; many have triumphed in ways nobody believed possible. All have faith, resilience, and a mighty heart. Vice President Joe Biden is a man who has learned that when you get knocked down, you’ve got to get back up and start looking hard—really hard—for the small kindnesses, the tender mercies, and the genuine good that still exists. Jimmy Greene writes of channeling grief into music after losing his beautiful six-year-old daughter, Ana Grace, on a sunny December morning in 2012 when she became one of the twenty-six people massacred at Sandy Hook Elementary School. It’s not easy to pick a favorite Note to Self, but I keep going back to Ryan O’Callaghan’s letter again and again. No one would ever look at this burly, tobacco-chewing NFL lineman and suspect that he felt broken and alone and so ashamed of being gay that he’d even begun planning his suicide. Ryan’s Note to Self had those of us at the CBS table reaching for the tissues, but I’m hoping it has some of you reaching for a pen and writing a note that speaks to the person you were in the past in a way that nourishes you, motivates you, and teaches you something about who you used to be and who you are today. Let the feelings flow . . .